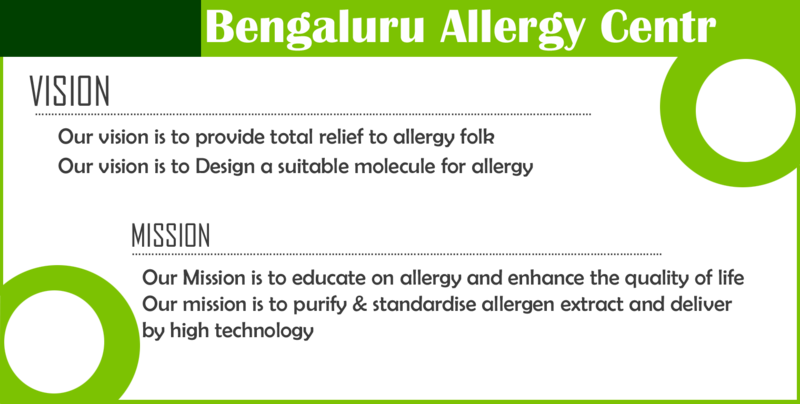 Bengaluru Allergy Center aims to provide health care including up-to-date allergy services to the deprived people of India. Allergy is a global public health concern, with up to 30-40% of people who are sensitized with one or more allergens (the substance can cause allergy) worldwide. This number could be as high as 56 million in India. To date, resources to develop awareness, modern diagnostic and treatment facilities of allergy for the sufferer in India are almost unavailable. In 1980 Prof Dr.D.N.Shivapuri, Prof. & Head of the Dept.of medicine. Patel Chest Institute, Delhi and the name of the center was nominated as per his suggestion. He was the first man to introduce the branch of Allergy in the field of Medicine in India and established the Allergy Research Division at Patel Chest Institute and he was popularly known as father of Allergy in India. The aim of allergy centr will be to treat with the most recent advance in diagnosis, management & treatment of allergic & Asthma patients. The stress will be on clinical as well as research in allergic disorders.